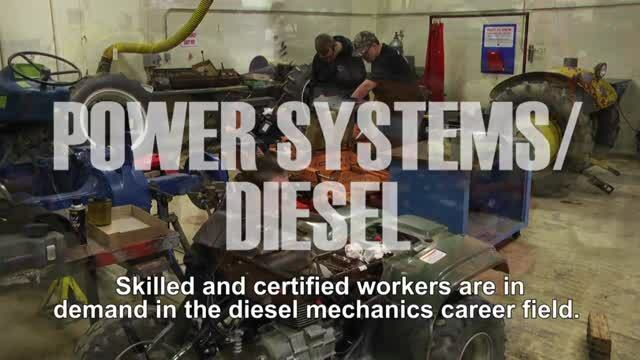 Power Systems students learn to repair and service gas and diesel engines, hydraulic systems, power train systems, electrical systems and air conditioning systems. 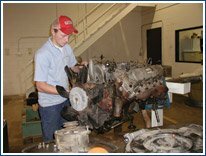 Students have the opportunity to overhaul, restore and maintain small engines, tractors and industrial diesel equipment. Graduates are prepared for opportunities in sales and service, small business, farm and industrial settings. Power Systems Technology is certified by the National Automotive Technician Education Foundation, commonly known as Automotive Service Excellence, ASE in Refrigerant Recovery and Recycling, and OKI Systems Powered Industrial Trucks. Colleges and technical schools that recognize credits earned in the program include Ohio Auto Diesel Technical College, Kubota Training Center, Massey Ferguson North American Training, Sperry New Holland Training, Ford Training Center, The Ohio State University and Morehead University. Seniors may be eligible for early job placement the second half of the school year. Criteria for placement include instructor recommendation, grade point average and attendance. Students in Power Systems have the opportunity to participate in FFA, a national organization for students interested in agriculture and leadership. All students also have the opportunity to participate in the Tech Prep Showcase through the Miami Valley Tech Prep Consortium. Contact Instructor Dan Tobler at 513-932-5677 ext. 5250 or dan.tobler@mywccc.org.